Where is it? : This wetland is bounded by the Flinders Highway, Broadbent, Keith and Billing Streets, Whyalla. 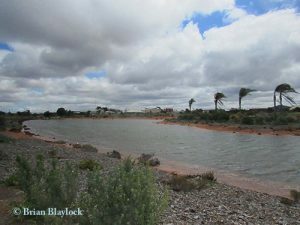 History: The Whyalla Wetlands is both a recreational and educational storm water purification facility developed by the Whyalla City Council. It’s based on the remaining 24.8 hectares of the original aerodrome, which operated on the site until 1951. The final development includes almost 6 hectares of artificial lakes fed by a combination of underground seepage and storm water runoff. Habitat: A man made wetland.